Dark kitchen cabinets: Pratt & Lambert Flint in California bungalow, upload feito originalmente por xJavierx. The kitchen of a California bungalow designed by Chad Eisner. Cabinets are painted Flint by Pratt & Lambert. "My clients joke that they can burn water, so the kitchen is really set up primarily for entertaining, with that big table as the buffet," Eisner says. "We tried a center island, but it looked like a behemoth. Then we found that table. It had been used by an artist and came with lots of scars, which is why no one ever has to worry about staining or cutting it. The built-in millwork and the surrounding cabinets are the same dark color we used throughout the house." Fixtures are from Waterworks. Photo by Karyn R. Miller, House Beautiful. 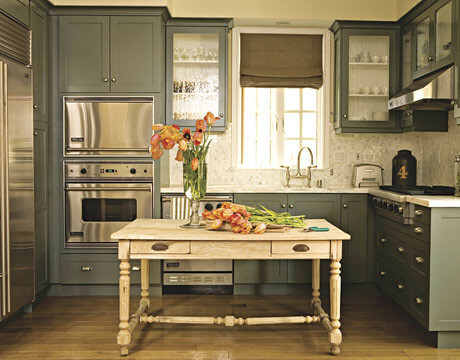 The secret to attaining satisfaction in products such as oak kitchen cabinets lies in the choice of service providers.